One RCA Composite Audio/Video Cable (Red/White/Yellow). You may need another cable to connect more than one source device to the TVGuardian. Remote Control – two AAA batteries are not included. These refurbished units have been fully tested, come with a one year warranty and may have some cosmetic blemishes. The TVGuardian model 401 has been discontinued by the manufacturer. Order yours today! The TVGuardian monitors the hidden closed-captioning signal and compares those words to it’s database of offensive words and phrases. When an offensive word is detected it mutes the sound for the sentence and displays a replacement text on the screen. Satellite, your Cable Box, U-verse, FiOS and antenna with a Digital TV converter box and VCR. For HDMI connections, see the new TV Guardian HD Model 501. 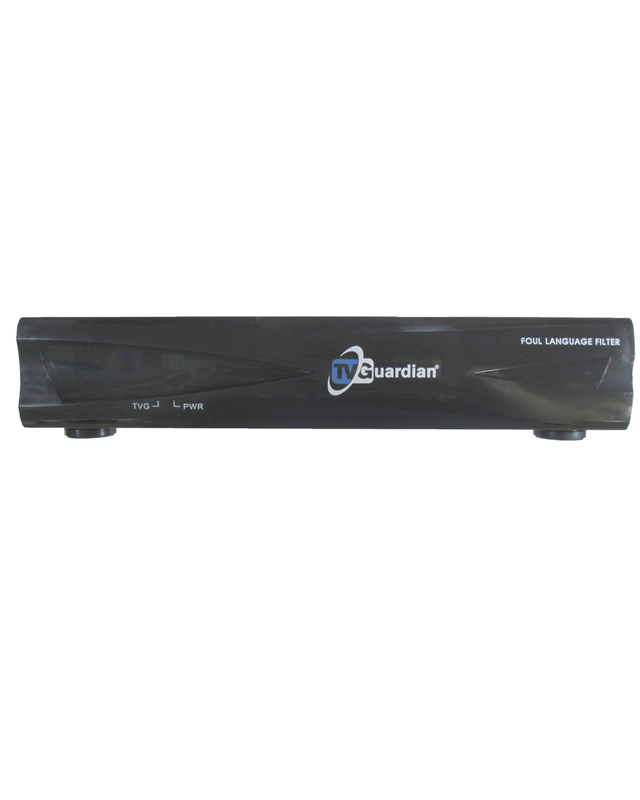 Use a Multi-port Video Switch to maximize the use of your TVGuardian. RCA (Red/White/Yellow) connection, S-Video Support, Digital Audio Support (Coaxial work-around) NOT COMPATIBLE WITH HDMI CONNECTIONS. Kids, Family, Parents and Other. Three Closed-Caption Settings: On, During Mute or Off. The TVGuardian SD hooks into your home entertainment system right before the TV. It connects between your tuner (cable box or satellite receiver, etc.) and the TV. Click here if you use a TV Antenna or Cable straight from the wall. Two RCA Composite Audio/Video Input Connections (Red/White/Yellow). One RCA Composite Audio/Video Output Connection (Red/White/Yellow). If you have several components, you may want to get the one of our Multi-port Video Switches for easiest installation and operation. Up to 30 days after you purchase the TVGuardian, if you are not satisfied with TVGuardian, just call us for a return authorization number and ship it back to us for a refund of the purchase price not including shipping and handling. TVGuardian comes with a one year manufacturer’s warranty on parts and labor. Please understand how the TV Guardian works and it’s limitations. Please read more information on compatibility with new and old technologies, including HD.